Saturday is the big day! Orphans of the Storm®, along with 25 other shelters in the Chicago area and even more shelters nationwide, is looking for your help to Clear the Shelters. If you’re ready to have a new furry friend join your family this Saturday, your adoption fee will be waived (fees for additional shots still apply). I’ll be there, hanging out with some of the shelter’s long-timers who are eager to find their furever home. This past weekend, though, I met some new pooches! 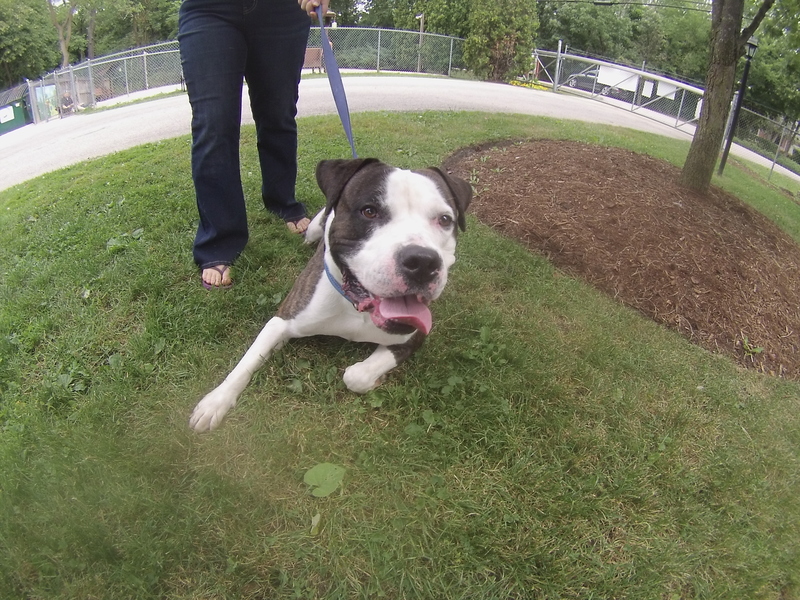 Parzivie the four-year-old Staffordshire Bull Terrier mix is so incredibly lovable. It is impossible not to smile when you spend time with this happy guy. He’s pretty strong and can sometimes pull when he’s on the leash, but that’s just because he is enthusiastic about everything! Parzivie does seem to have good manners, though. If I stopped walking for more than a few seconds while he was on the leash, he would either sit or lay down next to me to wait. Parzivie is also very affectionate. When I knelt down next to him to take his picture, he bounded right over and covered my face in doggy kisses. Parzivie loves to play. When we first got into the off-leash run, he tried to get the two tiny Yorkies on the other side of the fence to race with him (to no avail). 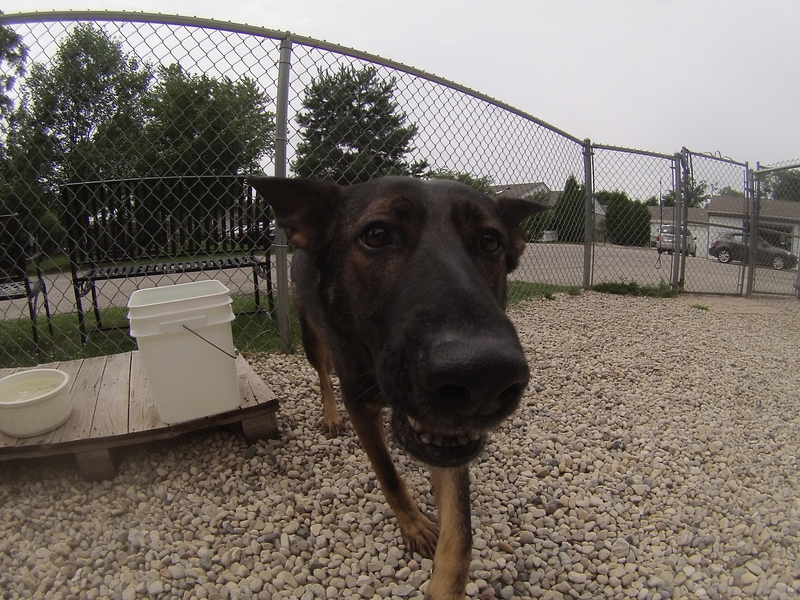 Then he spotted a squeaky hamburger toy and had a blast! He chewed on it, rolled it around on the ground, threw it into the air, and was very much capable of keeping himself entertained. The cutest thing was that when it was time to leave the off-leash run, he dropped the hamburger right at the gate so the next dog could play with it! If you’re looking for a fun, loving, and fun-loving companion, come in soon to meet Parzivie! Saddie is an affectionate girl who will gladly stand by your side and give you doggy kisses while you pet her. She does have a playful side: when Saddie discovered that there were little birds in the bushes in the off-leash run, she got them to fly out and started chasing them! On your next visit to the shelter, say hello to Saddie! 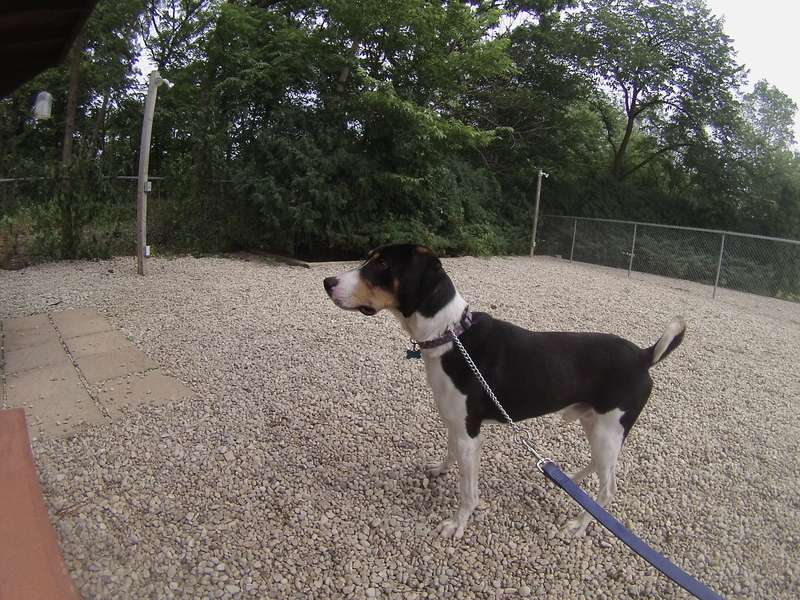 Franklin the one-year-old Treeing Walker Coonhound mix seems like pretty much a perfect example of his breed. 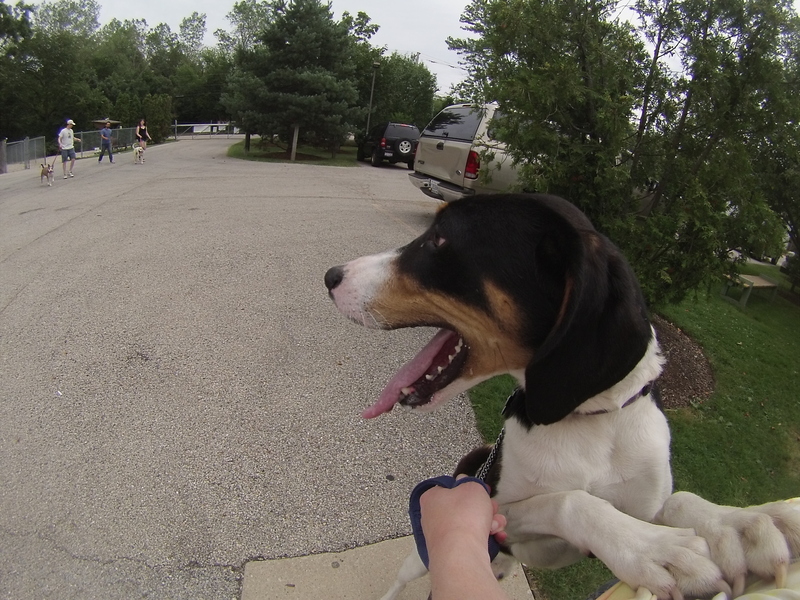 He has plenty of energy, follows his nose, is athletic, and has that great Hound baying voice. Franklin can be a little bit of a handful when he first gets out of his kennel, but he settles down after he gets to romp around for a bit and eventually became a good walking companion who stuck by my side. Franklin is a fan of giving doggy hugs and will stand on his hind legs with his front paws resting on you while you pet him. Since he’s both athletic and curious, he could potentially jump fences, so it’s a good idea to keep an eye on him when he’s off-leash. Franklin was originally sharing his kennel with another big Hound who has already been adopted, so he could go to a home with or without another dog. 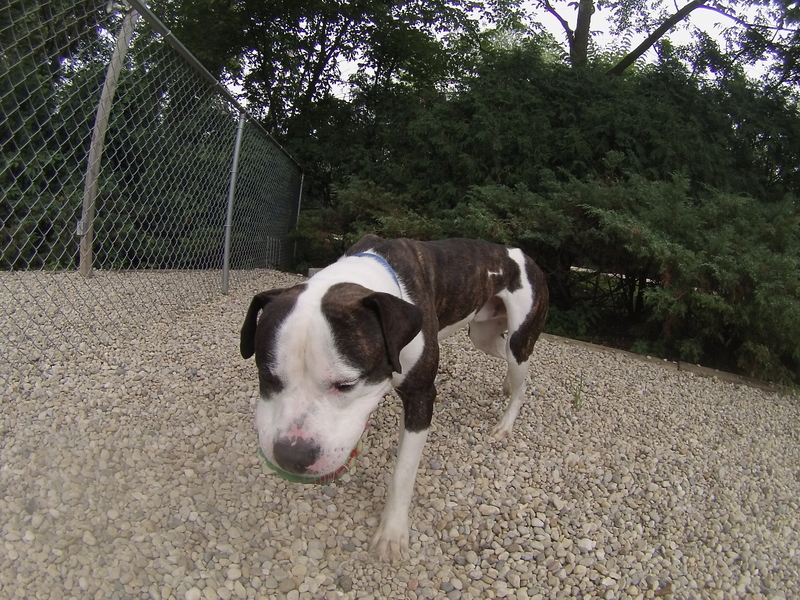 If you’re looking for an active new friend, come in soon to meet Franklin! 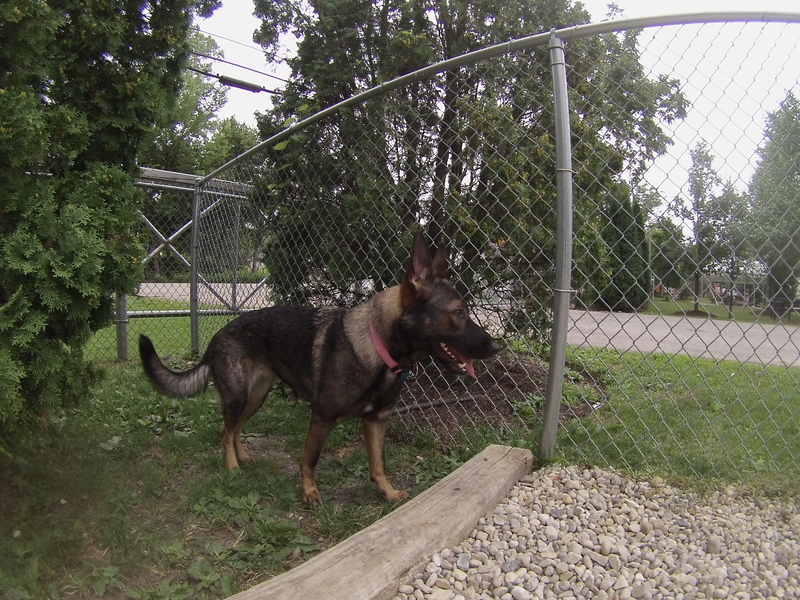 I also saw Bear, Blush, Clarinet, Honey Lamb, Lexi, Roxy, and Skippy. Posted by Meet the Pooches on August 13, 2015 in Dog Profiles and tagged adopt, adoption, animal shelter, animals, Chicago, Clear the Shelters, Deerfield, dogs, German Shepherd, Orphans of the Storm, pets, Riverwoods, Staffordshire Bull Terrier, Treeing Walker Coonhound. Hi Brad, thanks for reading! Yes, I have spent time with Clarinet on a few occasions and she is definitely a sweetheart. She loves to cuddle and give kisses. She always sticks her paw out to say hello when I walk past her kennel 🙂 I don’t know her history pre-Orphans, but the staff at the shelter can answer any other questions you have about her. I definitely recommend meeting her!